Marti Newland and Magdalena Stern-Baczewska performing at Brooklyn College. Photo by Jeffrey Taylor. In 1971, over four decades ago, H. Wiley Hitchcock and then-Brooklyn College Provost Sherman Van Solkema issued an ambitious list of projects for the new Institute for Studies in American Music. I’m delighted that many of these plans have been realized, though others have since lost their relevance or have manifested in ways unforeseen by the Institute’s founders. One project specifically mentioned in that document was the production of a TV series devoted to American music, and this, thanks largely to the efforts of our new special advisor Randall Horton, has now taken shape. Though the project has been in the works for some years, HISAM is now taking an active collaborative role. With the help of Brooklyn College’s Dept. 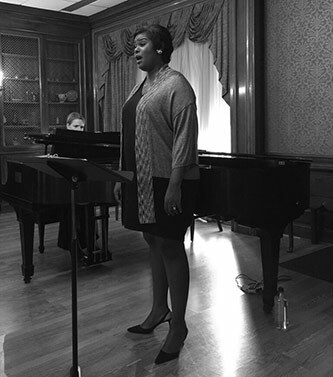 of Television and Radio (Stuart MacLellan, Chair) Horton has shepherded through several thirty-minute episodes featuring choral director Pastor Chantel Wright, klezmer and bluegrass musician Margot Leverett, composer and pianist Sunny Knable, and several others. The programs have appeared on CUNY TV and on PBS at Channel KRBC (North Bay Public Media, Santa Rosa, CA) with hopes of wider distribution in the future. We will keep you updated on the series’s progress; see the HISAM website or the series site at www.americanmusictv.org for additional information. Congratulations are due once again to HISAM Research Associate Arturo O’Farrill. After winning a Grammy in 2015 for his ensemble’s release The Offense of the Drum, he has been nominated again for Cuba—The Conversation Continues, with one nomination each for Best Large Jazz Ensemble Album and Best Instrumental Composition (for The Afro Latin Jazz Suite that appears on the same album). O’Farrill, Senior Research Associate Ray Allen and Institute Director Jeffrey Taylor have been shaping some new curriculum initiatives at Brooklyn College related to global and contemporary jazz. These exciting new directions for our Conservatory of Music will be announced concurrently with the College’s inauguration of the new Tow Center for the Performing Arts. This fall brought another slate of thought-provoking topics to our students and community as part of our Music in Polycultural America series. On 11 November we celebrated the Library of Congress’s Archive of American Folksong with guest John Cohen, who was joined by The Downhill Strugglers in a tribute to the southern folk music championed by Cohen’s legendary group, The New Lost City Ramblers. A detailed exhibit about the Archive was hosted by the Brooklyn College Library. On 23 November ethnomusicologist and multi-instrumentalist Samuel Torjman Thomas, with two gifted fellow musicians, showed how the music of Moroccan Jews in New York had joined improvisational practices from traditional Maghrebian music and jazz. And finally, on 7 December soprano Marti Newland (who also co-edited this issue of AMR) and pianist Magdalena Stern-Baczewska presented a moving performance of African-American spiritual arrangements, with special emphasis on women composers such as Eva Jessye, Margaret Bonds, and Undine Smith Moore.